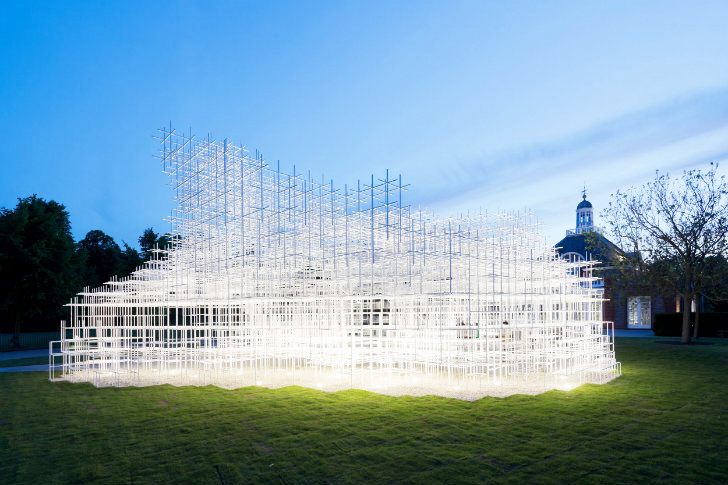 Japanese architect Sou Fujimoto's 2013 Serpentine Gallery Pavilion in London is set to officially open to the public this weekend! This year's pavilion strikes a delicate balance between nature and the works of man. Built from a network of steel beams, the geometric structure is almost cloud-like, and from a distance it appears as though mist were rising off the floor of the Kensington Gardens. Fujimoto designed the naturally daylit structure to allow visitors to feel as though they were in nature even while protected inside the pavilion. 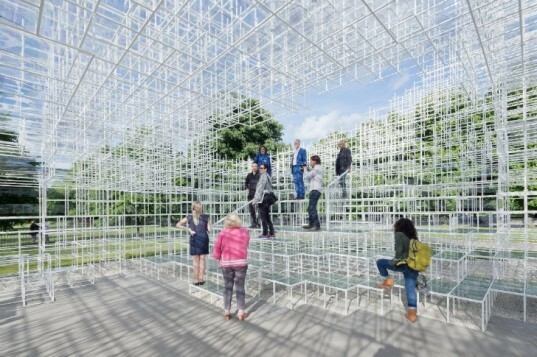 Sou Fujimoto's Serpentine Gallery Pavilion will be on view from June 8th to October 20th of 2013. 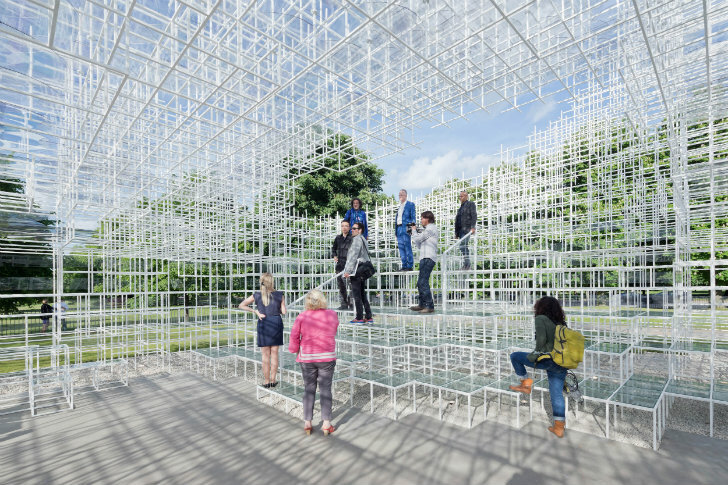 Sou Fujimoto is the 13th—and youngest—architect to be invited to design a summer pavilion for the garden, which will host a variety of events all summer long. Fujimoto’s works are known for their play on light, interaction with nature and their permeable membranes between the interior and exterior. Recently, we fell in love with both his House N and House NA that blur the boundary between nature and the protected space inside. Inspired by nature and organic structures, Fujimoto is working to change our relationship with the built environment. The Serpentine Gallery Pavilion will open to the public on June 8th and be open through the 20th of October. Sou Fujimoto will start off the season with a public talk on the 8th and more events will be held there throughout the summer. a href="http://www.sou-fujimoto.net/" target="_blank">Sou Fujimoto is the 13th architect (and youngest!) invited to design a summer pavilion for the the garden, which will hold a variety of events all summer long. Fujimoto's works are known for their play on light, interaction with nature and their permeable membrane between the interior and exterior. Inspired by nature and organic structures, Fujimoto is working to change our relationship with the built environment. The 2013 Serpentine Gallery Pavilion is made up of complex geometric network of 20mm steel poles. The delicate, lattice-structure occupies 350 sq m of lawn in front of the Gallery and provides room for cafe tables and seating as well as terraced steps at both entrances to provide extra seating for events. Completely transparent, the naturally daylit space is merely a thin barrier between the interior and the surrounding gardens. "For the 2013 Pavilion I propose an architectural landscape: a transparent terrain that encourages people to interact with and explore the site in diverse way," explains Fujimoto in his architect statement. "Within the pastoral context of Kensington Gardens, I envisage the vivid greenery of the surrounding plant life woven together with a constructed geometry. A new form of environment will be created, where the natural and the man-made merge; not solely architectural nor solely natural, but a unique meeting of the two." The Serpentine Gallery Pavilion will open to the public on June 8th and be open through the 20th of October. Sou Fujimoto will start off the season with a public talk on the 8th and more events will be held there throughout the summer.